1. 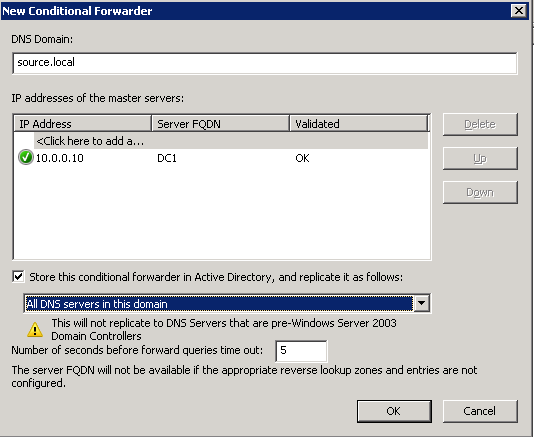 Open the DNS MMC console, right click on the server and select properties. 2. 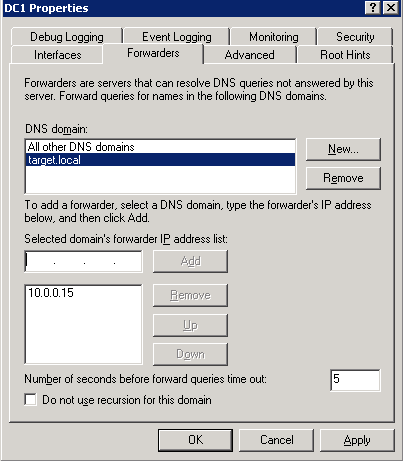 Select the 2nd tab along titled ‘Forwarders’, new, enter the other DNS Domain (the target domain in this case) and click OK. With the Domain selected enter the IP address of one of the DNS servers in the other Domain and select Add. The trust will be created completely on AD1 in the Target.local domain. 2. Head over to the Trusts tab and select new trust. 3. Enter the DNS domain name of the other Domain. 4. Choose External or Forest trust, to setup a forest trust both domains will need to be at a 2003 Forest Functional level or higher. As we’re dealing with two single domains an external trust is fine. 5. We’ll use a two-way trust. 6. 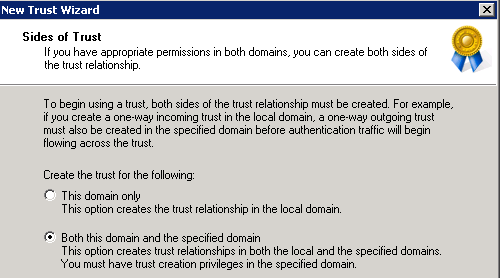 To setup both sides of the trust from the target domain you will need domain administrator credentials for the source/other domain. 8. Confirm both the incoming and outgoing trusts. I will cover SIDHistory in the next blog post, so we can ignore this for now. Here we can see the trust in place. Now that we have the forwarders in place in the source and target domains, clients from either domain should be able to resolve FQDNs from the other. However you will want to add the source/target domains suffix to the suffix search list, allowing simple, single-label names resolution. 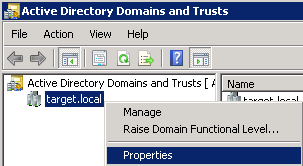 On the Server 2008 R2 server, open Group Policy Management in Server manager, right click on the level you want to apply the policy to and select Create a GPO in this domain, and link it here… We’ll call our GPO Trust – Suffix. 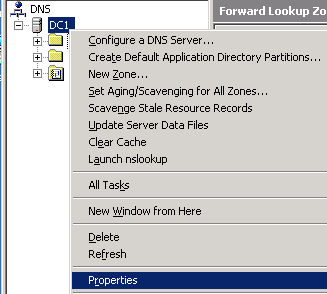 Dig down to Policies -> Administrative templates -> Network -> DNS Client. Set the Primary DNS Suffix to the current domain, so in the Target.local domain we’d put this was Target.local. Then enable the DNS Suffix Search List policy, add the current domain first, then add the other domain- seperated with a comma. 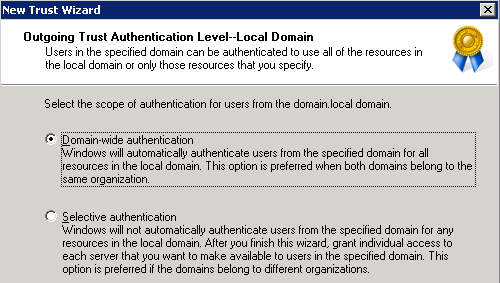 In the Server 2003 domain you can either add the policy via ADUC or via GPMC (http://www.microsoft.com/download/en/details.aspx?id=21895). The settings are in the same place. We can see the policy applied when we run an ipconfig /all. The clients will now append the primary suffix first, then try the additional suffixes found in the suffix search list. The account you run ADMT under will need to have administrative rights in both the source and target domain. You may decide to create a user specifically for the ADMT Migration, or you may use an existing user e.g. the default administrator account. I will create a user called ADMTUser and assign this user the correct permissions. This is the account we will use for the entire migration. It is recommended that you make the user account in the target domain and make it a member of the domain administrators group. 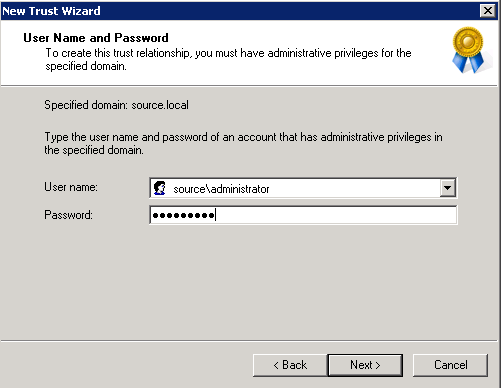 In the source domain add the same user to the builtin administrators group (you will be unable to add it to the domain administrators group). 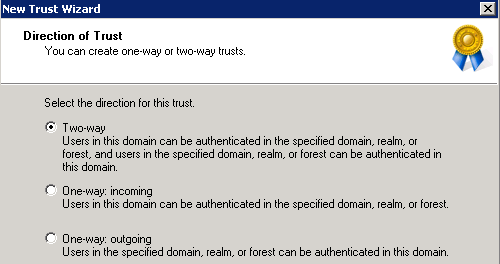 Today we tried to create a 2 way trust between 2 domains and we had an issue where as the trust would fail because it could not find any log on servers (domain controllers) we spotted in the domains and trust snap-in that the domain controller selected was not the one in the remote office. We have a hub and spoke MPLS network and only the remote office network has a route to the acquired company’s network. 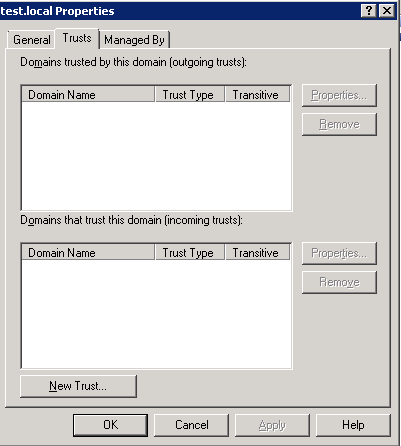 When we tried to change domain controller to the one in the remote office the new trust button was grayed out. We figured it had to do with the FSMO role holders (we moved all without really narrowing down which one was the crucial) Once we moved all FSMO roles up to the DC in the remote site we could create the forest trust. This guide is freaking awesome man! Best guide I’ve seen yet. Awesome guide, I’ve referenced many times recently. Thanks!!! Mate, awesome guide. Congrats and thanks for sharing. Loving this already. Very detailed and easy read.